Make more money as a freelancer by teaching what you know to people who know less than you do and will pay to learn. Doing this helps you become an authority. Freelancers who become authorities reap many benefits, like charging more for their work, getting more gigs through referrals, and making money from books and other products, says Nathan Barry, a software designer and author in Boise, Idaho. Barry was a speaker at the recent Double Your Freelancing Conference (September 16-18, 2015, Norfolk, Virginia). An authority is “an accepted source of information, advice, etc.” and “an expert on a subject,” says Dictionary.com. What’s the difference between freelancers who become authorities and other freelancers? It’s probably not skill level, says Barry. “If you teach, people will pay attention to you,” says Barry, who suggests teaching a skill that people can use to make money to people who have money to pay to learn that skill. Barry is the author of Authority and two other self-published books: The App Design Handbook and Designing Web Applications. In less than a year, he made more than $150,000 from these books. Don’t think you’re an expert yet? You’re probably wrong. “Every successful person I know started before they felt ready. Embrace the fact that you aren’t quite comfortable and strive to become even more of an expert,” says Barry. Newer freelancers are actually more qualified to teach than seasoned pros, says Barry, because they remember what it was like starting out and can relate better to beginners. Within the first few years of launching my freelance medical writing business, I started sharing what I knew about marketing. By leading roundtable discussions and giving presentations at conferences, I was becoming an authority—without even knowing it. In 2014, I decided to go beyond only freelancing and wrote two books on marketing for freelancers. 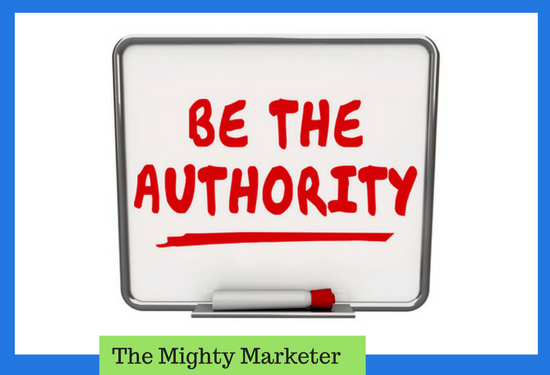 I started this blog and the rest of the Mighty Marketer website. While I haven’t reached Barry’s level of success, I expect I’ll move closer after I read Authority and his free A Brief Guide to Selling Digital Products. Writing, says Barry, is the “most scalable way to teach.” Start a blog, develop a free product that will help people in your target market, and write something you can sell, like a book. Use email marketing to build a following. “Share content authentically” and “give away more than you think you should,” says Barry. My Direct Marketing for Freelancers. To figure out what to write about, Barry suggests putting together an informal focus group of up to 10 people in your target market and asking them about their biggest frustrations. The two-day Double Your Freelancing Conference focused on actionable presentations on how to market, sell, and manage a freelance business like a pro, along with networking with freelancers ranging from writers like me to web developers, graphic artists, and computer programmers.